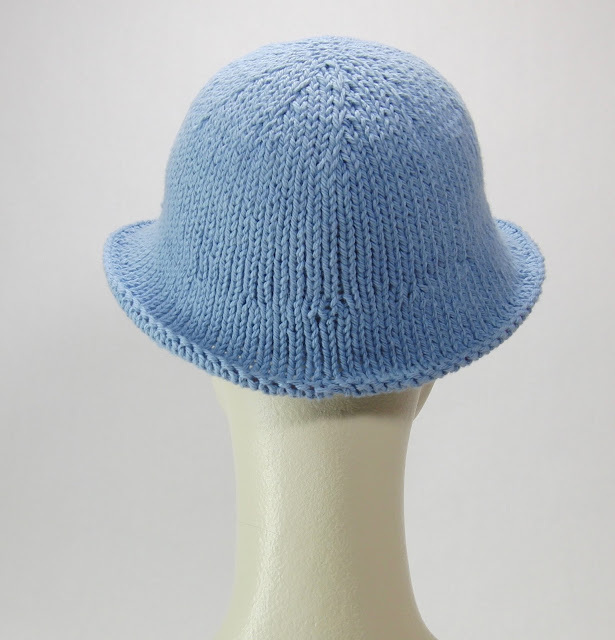 Another summer hat! This is my favorite indoor hat. 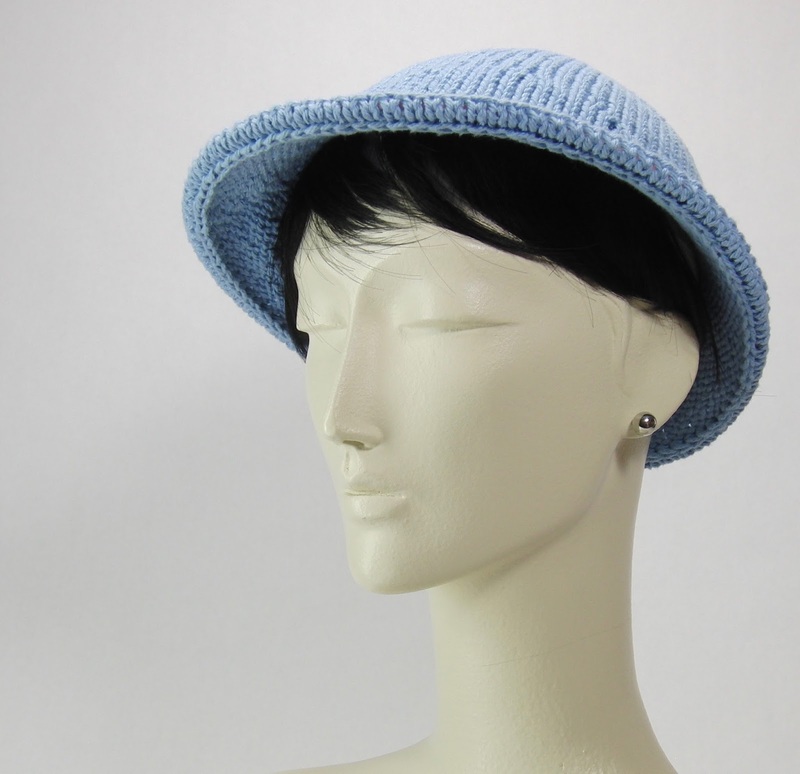 I've been wearing a lilac version of this hat all summer. I get aura migraines if bright light shines in my eyes so I like to wear a brimmed hat at all times. This hat is loose yet secure. 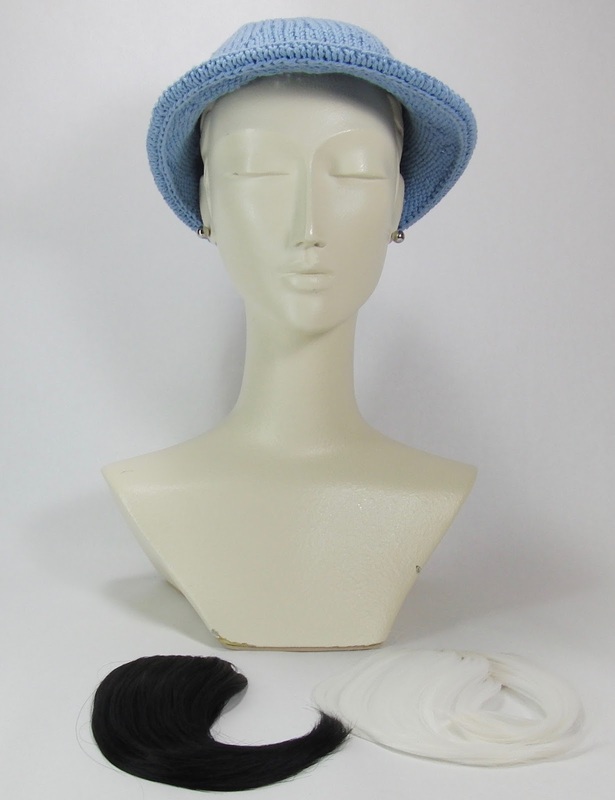 It keeps my hair out of my face but doesn't give me that feeling of having a ghost hat after I take it off. I can even wear it driving the car with the windows down and it doesn't blow off my head. 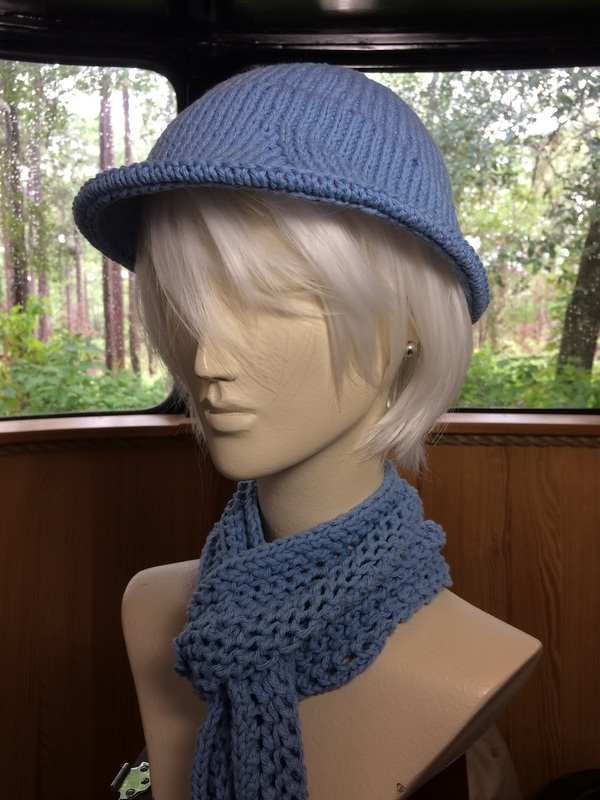 Here's the Ravelry entry for this pattern. Buy now for $5. I did a full three part video explaining every step of how to make the hat. If you buy the pattern you get time stamped links in the PDF to go right to the relevant part of the video. I'll also email you a Numbers file if you want to open the pattern on your iPad and use the checkboxes. I created a 3 part video playlist on my YouTube channel, beachton123. 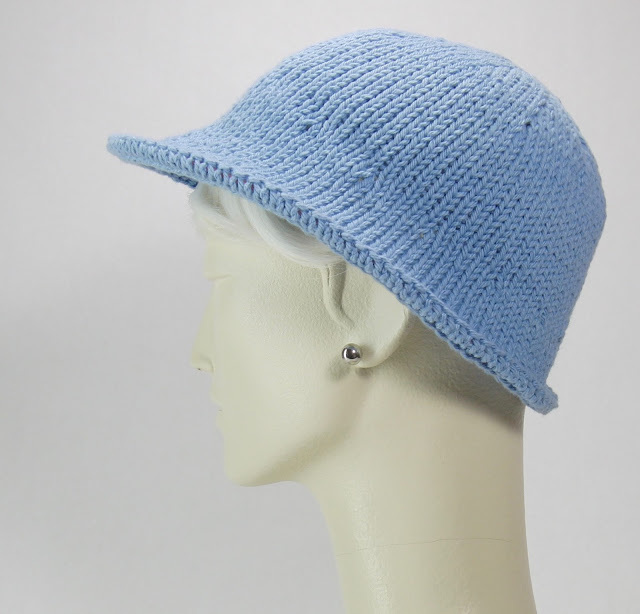 My mother thinks this hat would be a good chemo cap. 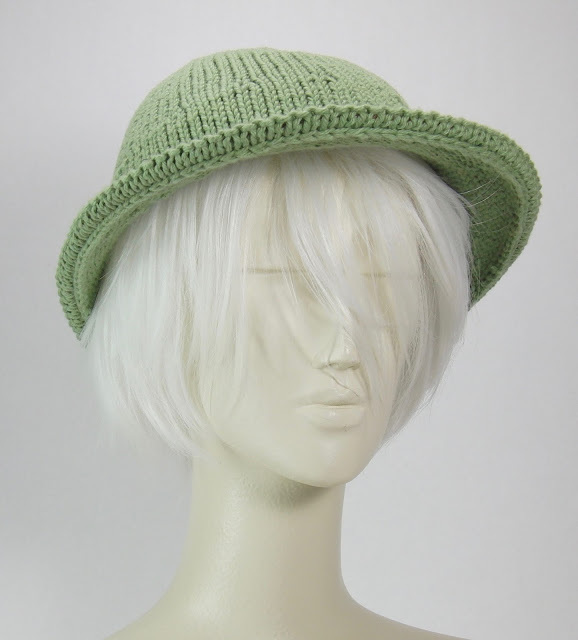 I did some rather tragic experiments on my own hair with clippers this summer and I was embarrassed to go grocery shopping without wearing this hat, so my mother is probably right. Here's how it looks on my mannequin without a wig. I recommend the size small for this situation. Size small on mannequin without wig. Circumference of head is 21 1/2"
I do not know a lot about losing your hair, but I do know a bit about cosplay wigs and fake bangs. I tested the hat with a few bangs I bought on Amazon to see if you can clip the bangs to the hat instead of to your hair (in the event you didn't have any hair.) You can! 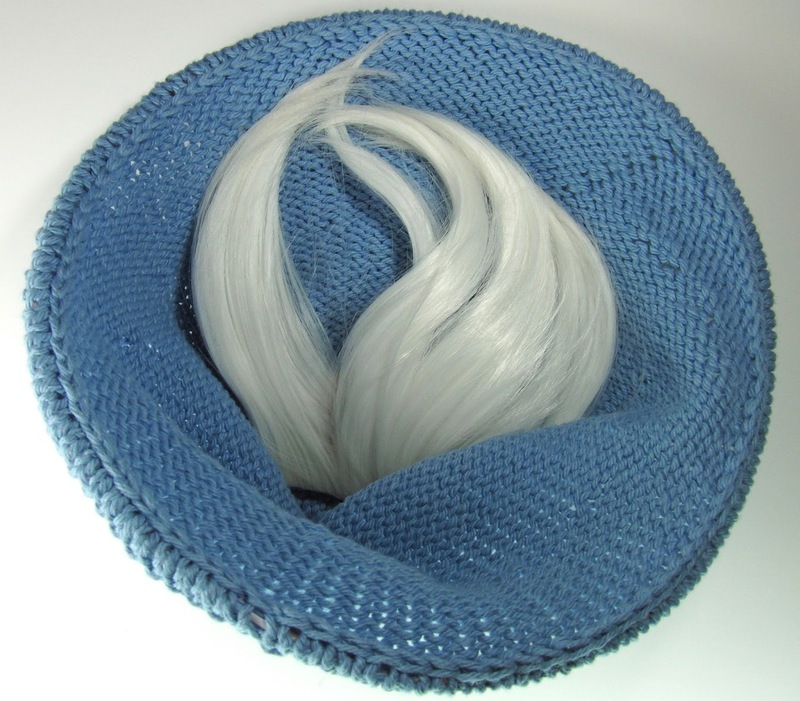 This is a wig clip I sewed to my white bangs when the original one broke in shipping. Just slip the end tines of the comb through some purl bumps on the inside of the hat. If you clip the fringe in upside down like this it still looks cute and you don't have that itchy netting against your scalp. I got both bangs on Amazon. The black ones are from Weixinbuy, for $2.93. They only come in black and brown. They ship direct from China and take a few weeks to arrive. The white ones are from MapofBeauty for $4.99, also a long wait to come from China. Those ones come in all the party colors, like pink and green and blue. I ordered some they call beige. They exactly match my own hair where I bleached it too much. They arrived after I already took photos. If the clip breaks in the mail (they come in an unpadded plastic envelope) you can get replacements at Sally Beauty. I sewed one of my extra wig clips onto a knit flower. My cousin reports her first grader will come home with the flower still where she put it that morning. The clip is too hard to operate for the little girl. Apparently this is a desirable situation from the mother's point of view. 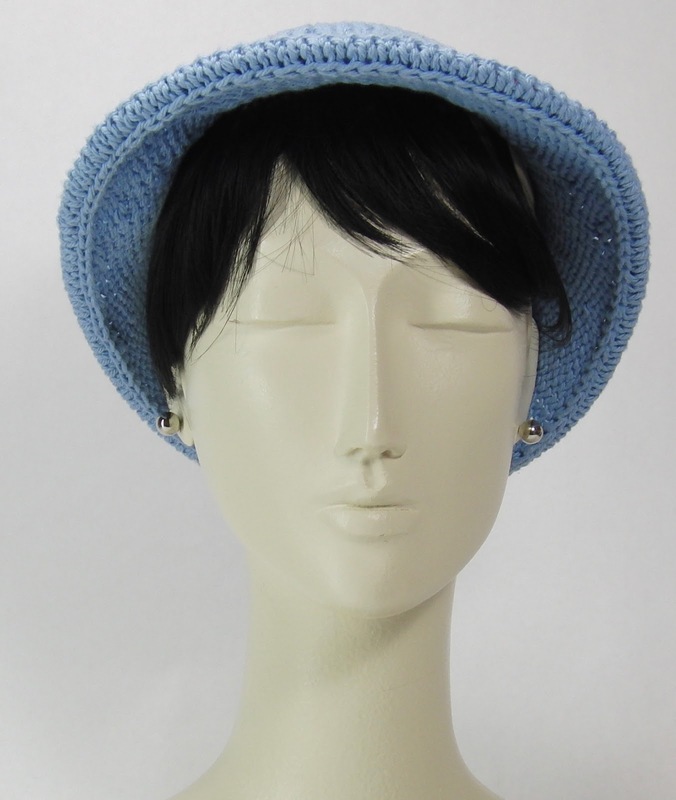 The size medium hat fits best on my mannequin with the wig on it. 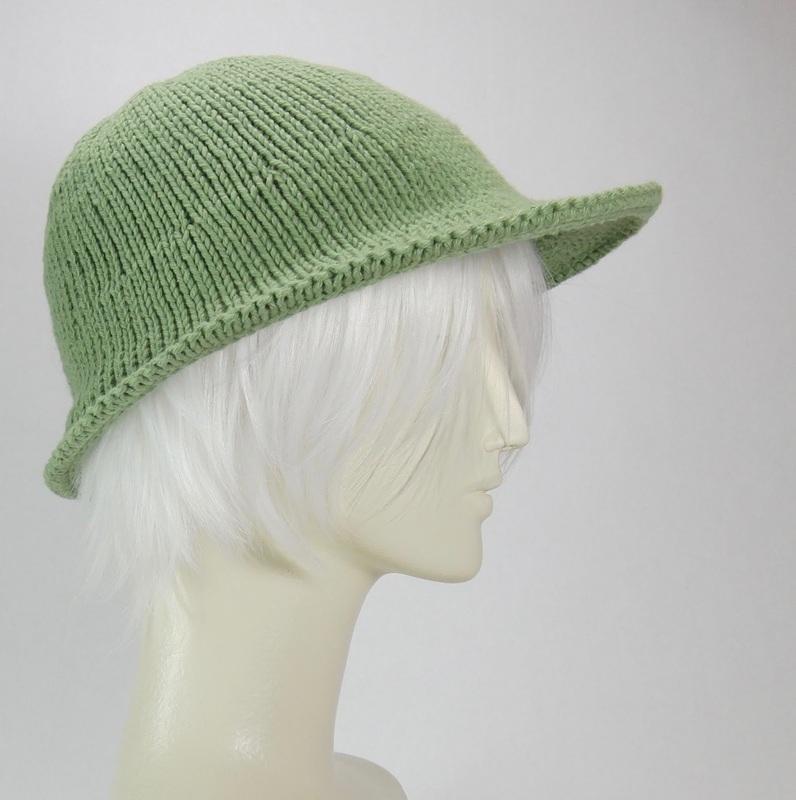 (22 1/2" with wig) I made the brim a bit bigger too in the size medium. The pattern has notations for where you can add and subtract rows to adjust the size. The top stretches to fit even my 23" mannequin. It's mostly the length you need to adjust for a larger head. 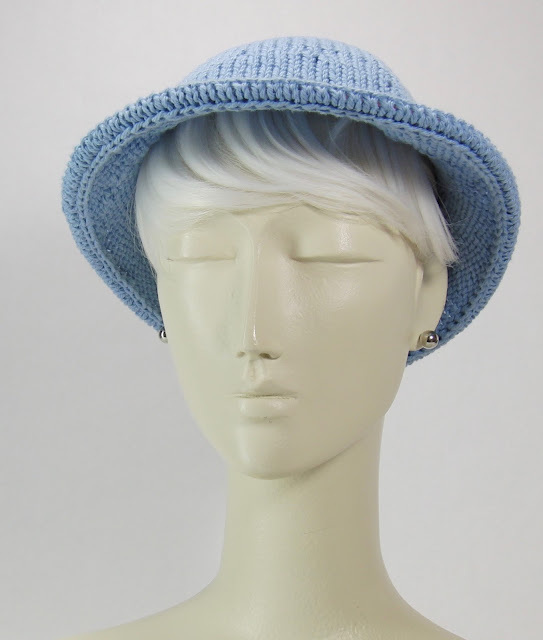 The top part of this hat isn't that hard but the short rows to make the extended front brim are tricky. I could not find complete instructions for working back and forth in short rows in the round. Lots of explanations of what to do on the knit side but nothing about picking up the wraps on the purl side. I figured it out by myself. Then I figured I better make a video since I hadn't found one that describes it to my satisfaction. I learned short rows from YouTube last year. I watched videos on regular wrap and turn, German short rows and Japanese short rows. (Eunny Jang illustrates 4 kinds of short rows in this video including two ways to do Japanese short rows.) I worked a few patterns with short rows like Purl Soho's Bandana Cowl and figured out how to do it reliably and even taught myself to knit backwards to keep from turning my work. 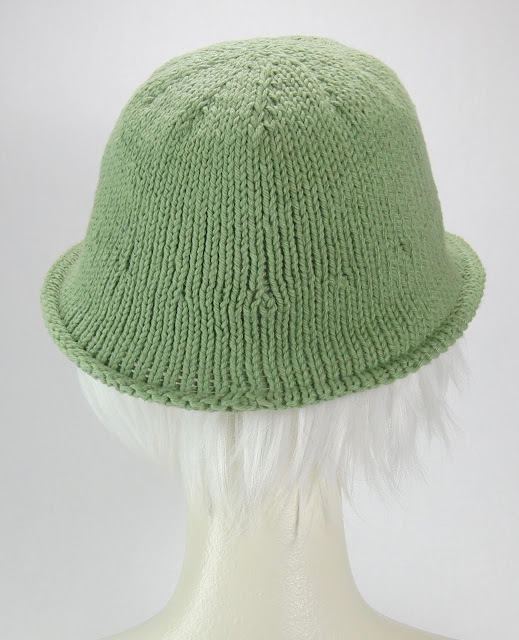 I made those short row intensive pieces with alpaca yarn though. When I'm knitting cotton I turn the work so I can keep my gauge consistently tight. My pattern is written for my own personal short row technique which is a hybrid of German and Japanese short rows that I totally made up. Instead of working the wrap with the next stitch after turning the work I knit it with the last stitch in the short row. I don't try to bridge the hole between the short row and the next stitch, instead I make the last stitch in the short row a lot tighter by working it the second time together with the yarn it was knit with before. 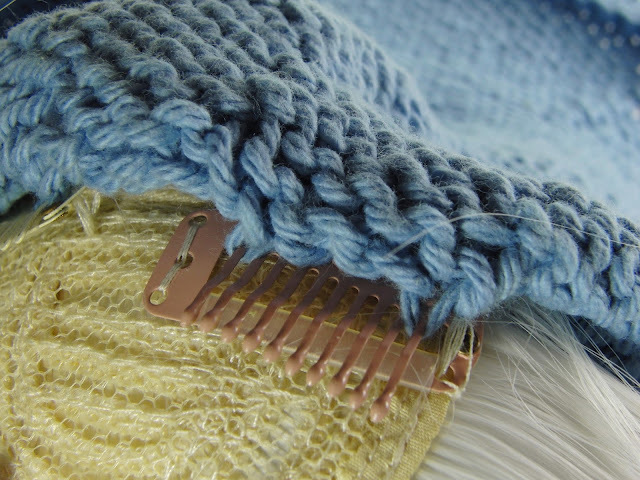 This is a hybrid of how German short rows work with the marker part of Japanese short rows. My video illustrates what I mean in the pattern. The abbreviation I use is j-wrp-t for Japanese wrap and turn, but what it means is work the stitch, slip it back to the left needle, place a marker on the working yarn, then turn the work. It isn't really the same order Eunny Jang does things in her video, and picking up the yarn is totally different. I call the yarn on the marker "the wrap" even though I never wrapped it around anything. My big breakthrough in short rows has to do with the direction of the right needle. The first problem is how to orient the wrap on the left needle, second is how to enter the two stitches with the right needle. Orient the wrap the same as the next stitch. For my technique the working legs (the side of the loop facing right) are both in the front on the knit side and in the back on the purl side. Knit side is easy. k2tog the usual way. On the purl side you have to get the needle in the real stitch first, then the wrap. This means purling two together through the back, going in the stitch first, then the wrap. Once I worked out that whichever stitch the right needle enters first comes out on top I was home free. Now I can stop knitting, turn and go back the other way and know what to do when I get back there again in any situation! 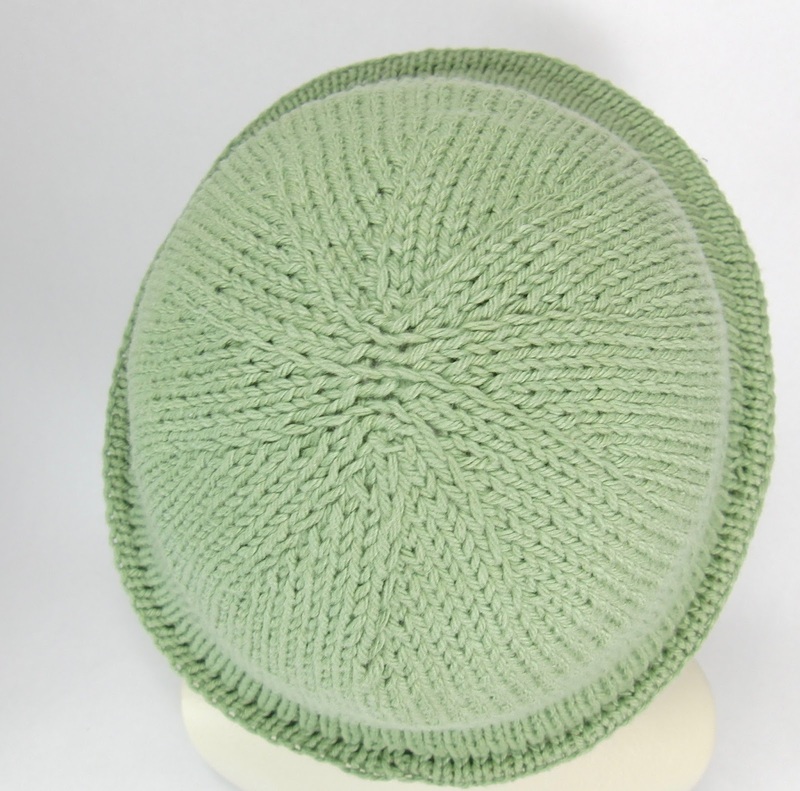 Here are more photos of the finished hat in size medium. I start with a Turkish cast on to get that top to be sort of oval. It's a 10 wedge increase done with lifted increases for maximum scalp coverage. For details on the nylon trimmer line I used in the hem of the hat refer to the blog entry for the Wind and Sun Hat. 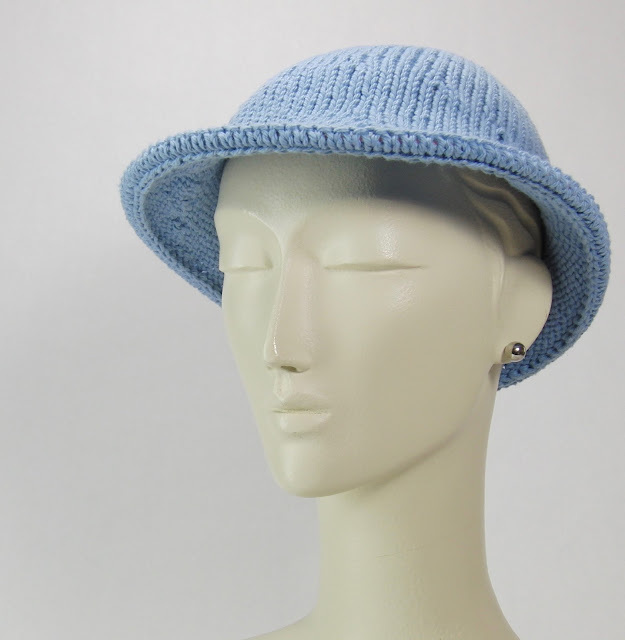 It's the same idea, but a little easier to implement because you knit the hem around the hoop instead of inserting it after the hat is all done. Here are the YouTube links to skip to the relevant parts of the instructions.